Oftentimes, a high water bill is due to water leaks that go undetected because not all leaks are visible and may be underground or concealed. Common types of leaks found in the home include worn toilet flappers, dripping faucets or showerheads, and other leaking valves. All are easily correctable. Residents are encouraged to routinely perform a water audit of all interior and exterior household fixtures. Learn about ways to spot leaks and repair leaking faucets and toilets. Learn how to prevent leaks during Fix a Leak Week, March 18-24, 2019. If you receive a high water bill that you think may be caused by a leak in or around your home, check the leak detection procedure at the water meter. Typically, the water meter is located in the front yard, near the street or sidewalk. Use a screwdriver to remove the meter-box lid. Then flip the meter lens cap to expose the meter face. Dirt may need to be removed to expose the meter dial. The meter face will look similar to this diagram. To determine if the meter has been misread, copy down the numbers on the meter's register. (The register looks similar to a car odometer.) Compare the numbers on the register to your "Current Reading" on your utility bill. The reading from the register should be equal to or higher than the "Current Reading." If the reading on the meter is lower than the reading listed on your bill, the meter may have been misread. Call Customer Relations at 305-665-7477 for a re-read and corrected bill. If the meter reading is substantially higher than the reading on your bill, there may be a water leak. Most meter faces have a flow indicator. If there is no water being used at the time of inspection, and the flow indicator is moving or spinning, there may be a leak somewhere in or around your home. Write down the numbers on the meter's register. Do not use any water for two hours, then take another reading from your meter's register. Compare it to the first reading. If the second reading is higher, there may be a leak. To pinpoint whether the leak is coming from inside or outside the home, close the house valve (generally located on an outside wall where the water line enters the home, or near the water heater). Repeat Step 1. If the meter continues to move, the leak may be outside the home in the service line that leads from the meter to the home, or in any water-using device that may be hooked to the system outside the home. Toilet leaks are the most common source, and faucet leaks can also happen without you knowing it. A leaky toilet can waste more than 200 gallons of water per day, or 73,000 gallons a year! Most toilet flush tanks work in the same way. The tank contains two valves: a flush valve and a refill valve. One type of refill valve is commonly called a ballcock/flush ball valve. The other type of flush tank has modern plastic valves. Bend the end of the float arm to adjust the tank water level to below the top of the overflow pipe. Replace the float ball, which may have filled with water. Replace a faulty or corroded float ball shut-off valve. Tighten a loose trip handle by turning the nut counterclockwise (looking from inside the tank). Straighten the control arm so it is free to move up and down without touching surrounding parts. Replace a sticking rod guide or ball rod. Clean a corroded brass valve seat with steel wool or with No. 500 wet-or-dry abrasive paper. Raise the guide arm if it does not allow the flush ball to rise enough for a complete flush. Be careful not to adjust too high, which will prevent the ball from completely closing. Adjust the sliding pinch clamp on the adjustment rod up to raise the water level or down to lower it. Tank water level should be just below top of overflow tube when toilet has refilled and shut off. Reposition bowl refill tube. If it is out of place, water is routed directly into the tank rather than flowing water into the bowl. The refill tube should aim directly into the overflow pipe but should not reach below water level. Replace defective refill tube with new plastic refill tube. Replace flapper by disconnecting the lift hardware from the trip arm and sliding the flapper (5) up and off the overflow pipe. Install the new unit, reversing directions, and connect the lift hardware back to the trip arm. Cut off excess lift chain (6) or leave dangling if it doesn't interfere with toilet operation. Another common source for leaks is the faucet. Leaking faucets are usually caused by worn washers or "O" rings. Water lost because of a delay in leaky faucet repair can be more costly than buying replacement parts. The chart below shows how much water a "slow drip" can waste, assuming the standard 60 psi (pounds per square inch) pressure in your pipe. Shut off the water supply to the faucet being repaired. Remove the cap on top of the handle, and remove the exposed screw by turning it counterclockwise. Remove the valve stem from the faucet body by placing the handle back onto the valve stem and rotating it in the direction that normally turns on the water (direction can differ depending on faucet design). Remove the screw from the base of the valve stem, and replace the worn washer with a new washer, making sure it's the right size. Reassemble the faucet. Check to make sure it works properly and the leak has been repaired. Your home probably accounts for the largest portion of yearly expenses, and the last thing you need is a high water bill. Leaky pipes are often the cause. However, if left unattended, the problem could worsen. The Miami-Dade Water and Sewer Department understands your concerns and as a courtesy would like to help you with understanding why your bill may be so high and ways to reduce it. 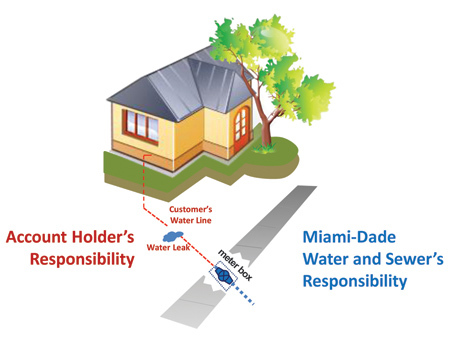 Is Miami-Dade County responsible for my water leaks? Miami-Dade County's Water and Sewer Department is responsible for maintaining the water service up to and including the Meter Box. This includes the performance and repairs of the meter. The County is unable to perform repairs on private property, provide advice for specific repairs or make plumbing/contractor recommendation or referrals. The account holder is responsible for all water consumption past the meter box whether concealed or underground.